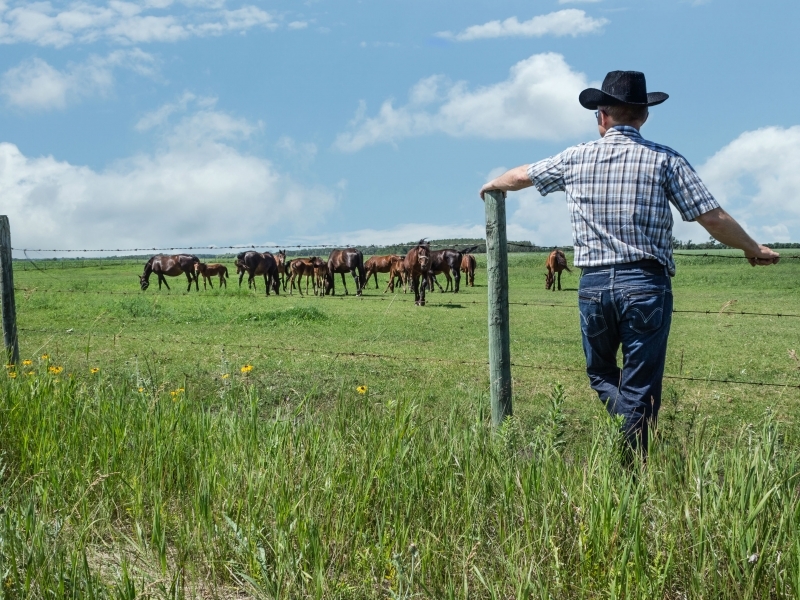 What’s the deal with horse fencing any way? Why is it such a big deal? All animals, including us, have what is referred to as a fight-or-flight response. This is a physiological response to a perceived harmful event or attack, or threat to survival. This response is what makes choosing the right horse fencing so important to the safety of your horse. Horses prefer to flee from danger (Flight), if possible. However, if flight is not an option, horses will fight to protect themselves from a perceived danger. Horses evolved from small mammals whose survival depended on their ability to flee from predators. We as humans are responsible for the outcome of this evolutionary flight response. With this being said, we can minimise potential harm caused by this response and potentially fatal consequence. We can create a safe environment for our horses. And by safe environment, I am talking of a well maintained paddock with specifically designed horse safe fencing. The below information discusses the different types of commonly used horse fencing systems worldwide. Combining the strength of wire with the safety and durability of Plastic. Wire reinforced rail commonly known as Zappa Rail has been manufactured by Think Fencing since the early 2000s. Zappa Rail It is a purpose built horse fencing product used to create a horse safe fencing system. It is made out of two high tensile wires running along the top and bottom edge of the rail. Encapsulating the wires is a High Density UV stabilised polymer. This polymer not only coats the wires it also runs between the wires creating a sturdy structure. The rail has a very large surface area compared to wire. In the event of an impact the rail will absorb the load along the entire fence run. Resulting in minimal damage to the horse compared to a wire or a solid timber fence. 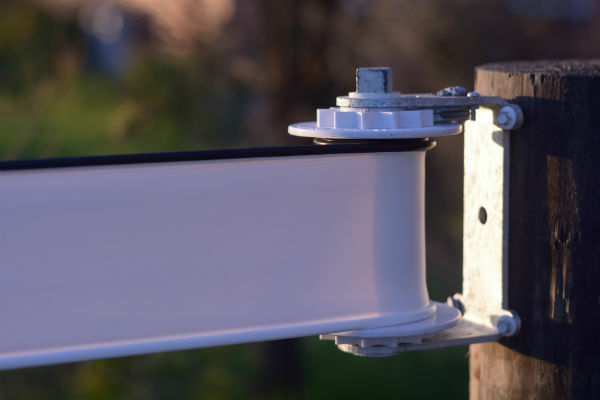 The rail is generally electrified when installed as horse fencing, this has been made possible by incorporating a highly conductive polymer over moulded on top of the steel wire reinforcement. A standard electric fence energiser is used to run a charge through the top of the rail. Consequently when a horse comes in contact with the fence it gets a shock. 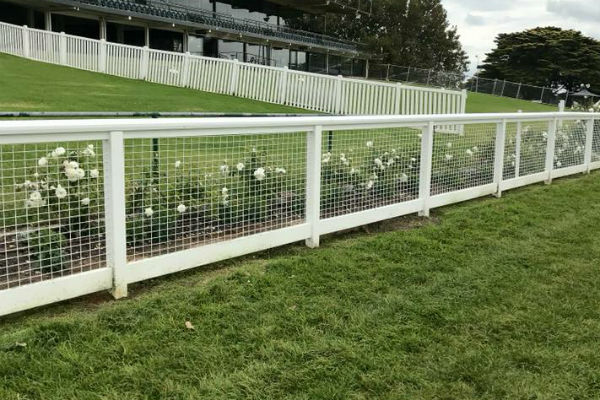 This style of fencing rail can be adapted to Timber or Plastic Posts, The horse fencing rail is attached to these posts using an insulated bracket. This bracket allows the rail to be tensioned along the fence run with an insul-strainer (as pictured). This system allows the rail to be fully strained and insulated with no specialised tools or equipment. Not only safe, this product looks great and is easy to install. Watch installation video here. 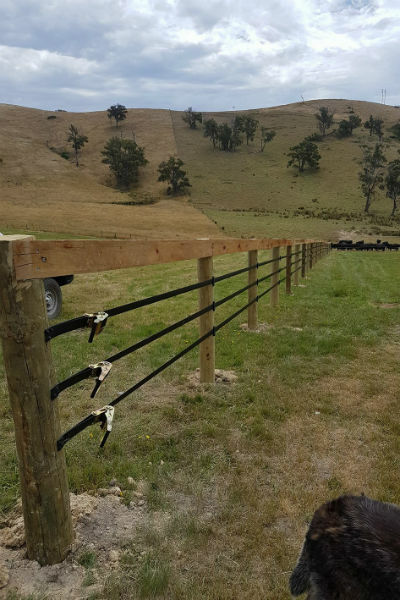 Post and wire is the traditional farm style of fencing you will see all over the world for enclosing all types of livestock. Not really designed as a Horse Fence, this style of fencing is typically made using treated pine or hardwood post of 100-120mm in diameter sitting 1200mm above ground. Depending on the livestock kept behind it it will have up to 12 wires. The wires can be classified into three categories. Low tensile, Medium tensile and High tensile. The wires range from 2.5 to 3.5mm in thickness. Posts are commonly spaced from 6 to 12 meters apart. Plastic or timber intermediate droppers are used to separate the wires over the longer spans. 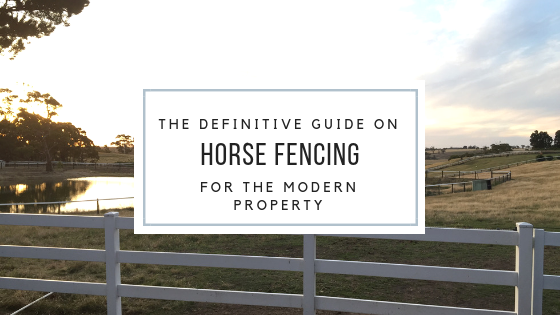 Considering this style of fence is not traditionally designed to be used as a horse fence it may be all you have to work with, or your budget will allow. With this being said let’s explore the options available to make this style of fence a safer alternative. Low tensile wire will often stretch before it breaks, consequently, when a horse strikes out or collides with a the fence the wire will give way rather than break and act like a cheese slicer on your horse, potentially causing significant injury. An ideal post spacing is 6m. Any further you will require droppers to hold the wires apart. Your top wire is recommended to be 200mm from the top of the post leaving room for a sighter strip such as Equirail. 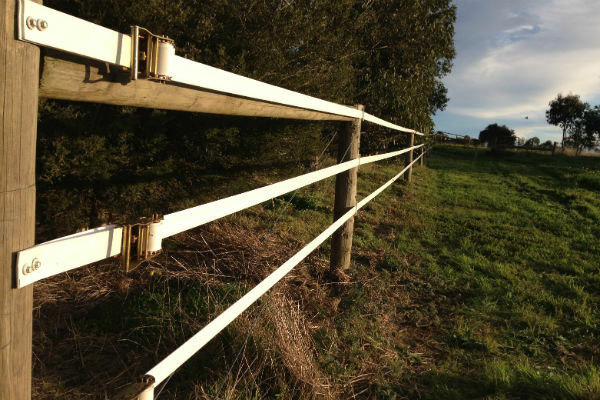 Equirail is a cost effective Horse safe Polymer Horse Fence rail that will provide additional safety and visibility when attached to a wire fencing system. The lowest wire should be no less than 500mm from the ground, as a horse rolling may get trapped in the lower wires. A wire horse fence of 1200mm above ground should not require any more than 4 wires and one run of Equirail. 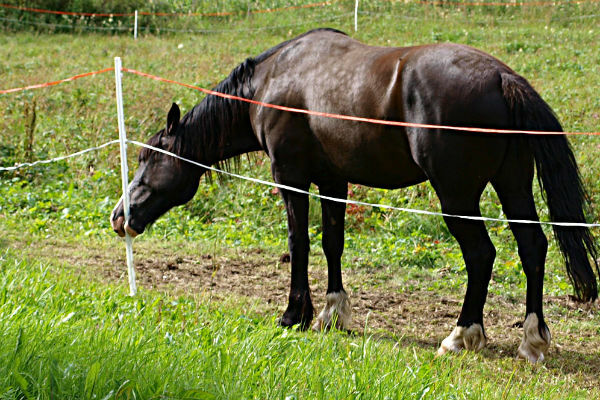 Post and Electric Woven Mesh is a cost effective semi permanent horse fencing solution. For this reason its widely used as a temporary horse fence, coupled with the ability to be electrified its a cost effective alternative. 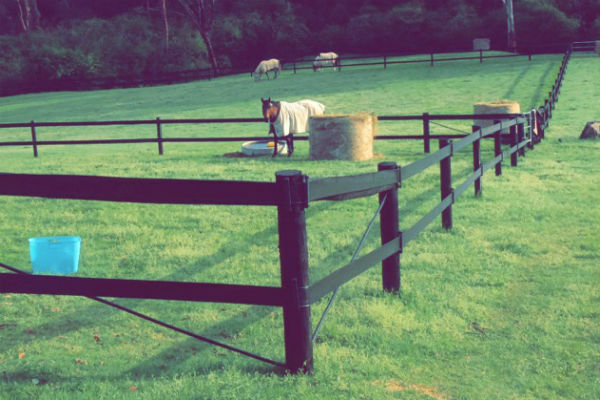 This type of horse fencing is traditionally made of UV stabilised nylon, woven into a strip of 20mm to 50mm flat or 8mm to 12mm round. The centre of the mesh incorporates a copper or stainless steel conductor wire 0.2mm thick allowing the mesh or rope to be electrified by means of an electric fence energiser. The mesh or rope can be attached to a range of posts using supplied insulated fittings that allow the product to be strained through the insulated section of the fitting and tied off at either end using specific tensioners. Many companies offer options to fit this type of horse fencing to all types of posts including steel star droppers. For temporary fencing they offer plastic moulded posts up-to 1300mm high with a steel spike at one end and a foot pad so you can push the post into the ground with your feet for temporary horse fencing applications. Combining the traditional elegance of timber post and rail without the maintenance and cost. PVC is the most widely used polymer in construction materials. This is part due to its durability and ability to withstand the outdoor elements, whilst minimising warping and degradation like many other polymers. Unlike most consumer polymers, PVC is its actually derived from 57% Natural Sea Salt in the form of Chlorine. It does not bioaccumulate in the earth and can be recycled. Many PVC products made in Asia still use a lead stabilised polymer. Where possible when ordering make sure the company has best practice pvc accreditation. Currently Think Fencing is the only company in the world who has this certification. With this being said, not all PVC Horse fences were created equal. PVC has been used as a substitute for timber for over 30 years, the first companies to do this were PVC pipe manufacturers. They used the same material used to make down pipe to make PVC Horse fencing. The issue here is that this type of PVC was never designed to withstand a horse kicking it or retain its structural integrity for decades. Sadly many companies are still using old technology to manufacture this type of fencing. 30 Years ago timber was very cheap and PVC was considered an exotic material, therefore more expensive in comparison. Fast forward to 2018 we find ourself in a world wide timber shortage with a large portion of low grade timber ending up as fencing material. Polymer technology has come a long way, companies such as Think Fencing are developing composites whereby two or more polymers are combined to form an extremely strong, long lasting composite used to create their horse Fencing range. Typically this type of horse fencing is made up of a hollow post of 127x127mm wide with a 5-8mm wall section. The post has slots routed in it to allow rails to slide through the post. This gives the look of a traditional morticed timber fence. Think Fencing has developed technology to co-extrude a capping layer over the outside of the White PVC, consequently a myriad of colours and textures can be built into the post and rail within a single process. Meaning it will not peel off, and is highly scratch resistant. Think fencing has developed technology whereby a wood grain pattern and colour can be combined with the external composite layer to create a totally random finish that mimics timber, its not only beautiful its long lasting, requiring minimal maintenance compared to real timber. It is common for passers by to mistake this type of horse fencing as real timber. 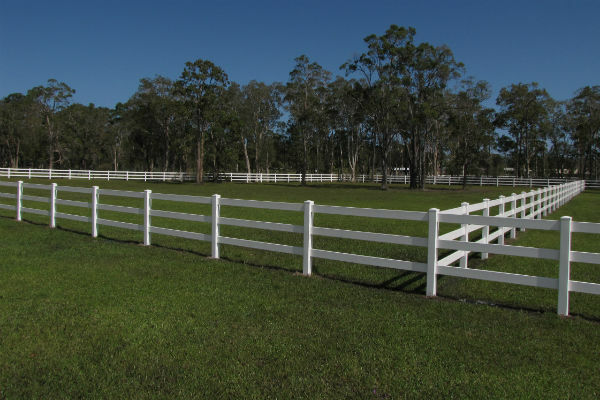 For use as a horse fencing application this type of fencing provides excellent strength and good looks. If a horse collides with the fence the rails will give way and release from the slot in the post. Minimising any potential damage to your horse. Electrification can also be added for additional safety. 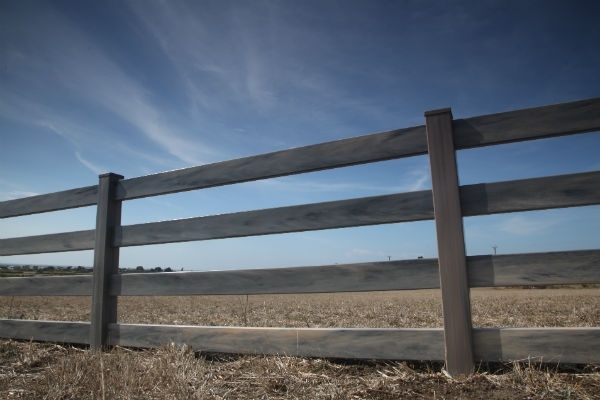 Post and Rail fencing made from Timber is the classic rural ranch fence that has been used for centuries. This type of fencing provides excellent containment for your animals and depending on the quality of timber used it can last for Decades. Timber such as Forest RedGum, Cypress Pine, and Ironbark are commonly used to create a Horse Fence. Whilst it’s a strong and durable fence, It can be one of the most expensive fencing systems. As can be seen in traditional properties around the world, Post and Rail fencing looks good. 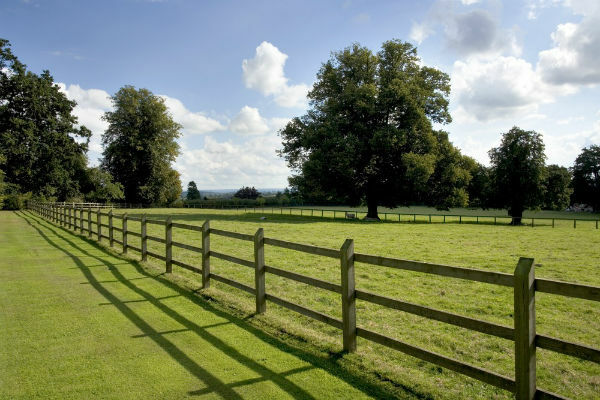 Generally speaking Timber post and rail fencing set the standard for horse safe fencing. 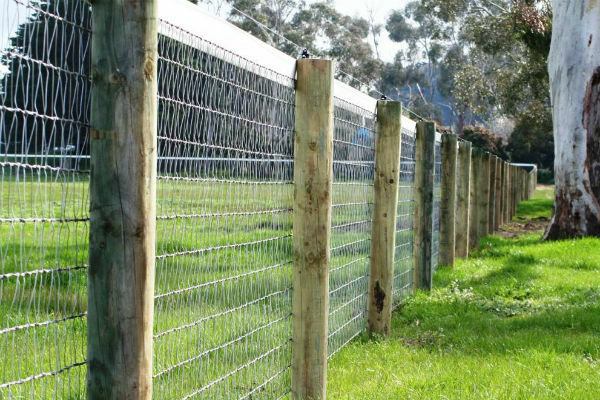 With Modern technologies and specifically created Horse Fencing systems it is now seen as a product used purely to add aesthetic value to your horse property rather than a horse safe fence. 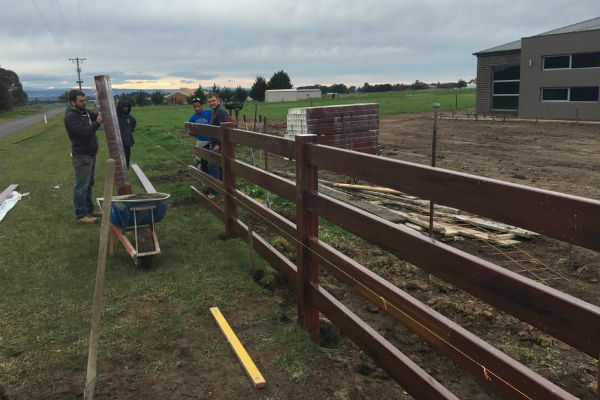 In effect Timber post and rail fencing is not as safe as the other alternatives due to the fact that it offers no flexibility if a horse collides with the fence. Mesh fencing has been available for over 20 years in Australia and offers a good safe fencing system. It is made up of wire from 1.5mm upto 5mm that is woven into a mesh pattern. Either Diamonds, Squares or rectangles. The mesh is generally structured in a shape to prevent a horses hoof making its way through the mesh if it decides to collide with the fence. Available in rolls of up to 50m long or panels upto 3m long, it can be attached to wire that is tensioned up along the top and bottom of a standard fence, or fixed directly to posts and rails. For the most part this type of fencing is not designed for its aesthetic appeal, rather its designed to be a functional horse safe fence. Whilst not being very visible in certain conditions, many property owners choose to install a polymer rail above the mesh panel fence to increase the visibility. Safe and simple to use this type of fencing can be used as an add on to PVC post and rail fencing. It can be installed on a wide variety of posts. Equirail horse fencing is a newer addition to the range of horse fencing options available today. It is based on the same concept as Zappa Rail or polymer composite tensioned rail. However it does not have any wire built in the rail. It relies solely on the polymer to provide strength. The equirail rail is strong enough to withstand a horse colliding with it and not break under a certain strain, with this being said it will minimise the risk of injury in the event of a collision. Equirail is very easy to install and if often used as semi permanent fencing system. It is commonly used to enhance the safety and visibility of wire fencing or as a stand alone fencing system. Equirail is tensioned using a permanently mounted tensioner, similar to a ratchet load binder. It is cranked up to the desired tension by hand. Equirail rail runs through brackets that are screwed onto the posts. 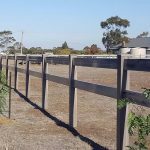 Commonly available in black or white this horse fencing system is one of the most versatile cost effective systems available. 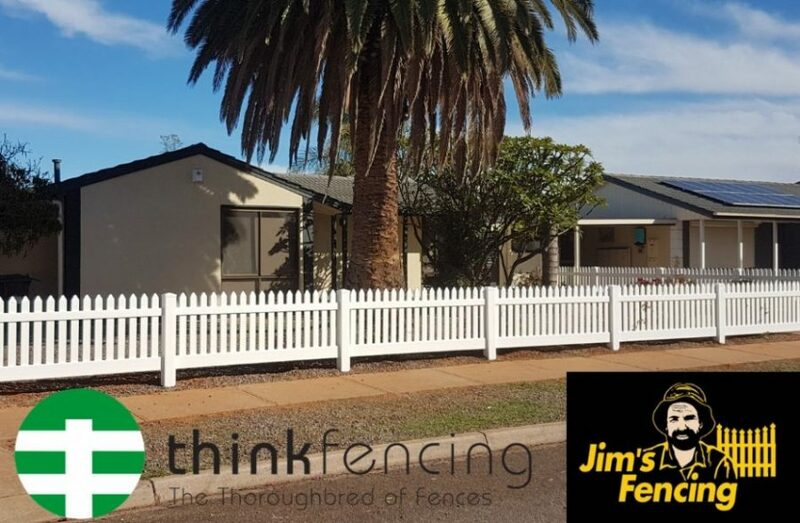 Jack Fitzgerald is CEO and founder of Think Fencing, Australia’s largest manufacturer of composite fencing systems. He established the company at an early age after witnessing first hand the damage a wire fence caused to his mothers horse. Jack is considered a foremost authority on fencing technology. Having co-developed a thoroughbred race track running system with Simtrack and was the first to electrify wire re enforced polymer rail in 2006. Jack holds several Patents on fencing inventions.